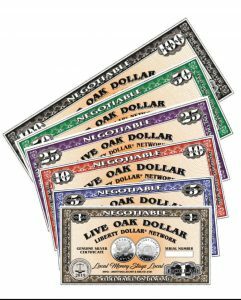 The New Liberty Dollars are finally available, as paper Silver Certificates that can be conveniently carried and used like money with merchants or others who voluntarily agree to accept them. They will be of an entirely new and original design by Bernard von NotHaus, and will be issued and promoted as a Value-backed Community-based currency that will help to keep more of the spending power of the community at home where it belongs. Big-Box Retailers and National Chain stores and restaurants are serious drains on the local economy. Even when they seem to be large employers, the money they pay to their workers is a tiny fraction of the local money they take away from the community every day, and that loss means that local stores see less and less of the community spending power. The very presence of stores Like Best Buy and WalMart has caused hundreds of local shops to go completely out of business. Those are your friends and neighbors who are being driven into bankruptcy. Many communities around the world have created their own form of community currency or "local dollars," only to see them fail to find acceptance by businesses. This is because they have no actual value, and cannot be readily converted to Legal Tender when the bills mount up. However, when such programs gain acceptance and widespread use, participating merchants learn quickly that it means greater profits and financial stability for the community. Many towns will find that hundreds of small businesses will agree to accept the local currency despite the fact that they may lose money on some purchases due to currency discounts, because they find that customers tend to give them more repeat business. Coupons seem to be a boon to shoppers, but redeeming them can take weeks for the merchant who accepts them. That means that the merchant is waiting a long time for the money the coupons represent, and it involves a lot of extra work to count them, sort them, send them to the individual manufacturers and eventually collect the money, but it means that shoppers will be coming to the store--so the merchants put up with it. Community-based currencies work similarly in the way they bring shoppers into businesses that accept them, but they eliminate the work of redemption when they succeed. This is because shoppers are usually willing to accept them in the change they receive, knowing that they can use them again at the same store or others who are participating in the program. Community currencies represent money that stays in the local economy, rather than being shipped off to some corporate headquarters to be shared among stockholders who will never spend a dime in the community of origin. The effect has been to save some local businesses from shutting their doors altogether, and has even been shown to stall the growth of big-box retailers such as Wal-Mart, Target and Best Buy. Studies have shown that communities who adopt some form of local currency keep a greater portion of the local spending power circulating in the local economy. Obviously, money spent at big box stores is going to leave the area altogether, but the community currency they reject will be found continuing to circulate locally for years. Attractive to the local public. Convertible back to Legal Tender when necessary. They can also instill a sense of community pride that further aids in supporting small business efforts. Merchants and business owners who agree to accept Community-based Liberty Dollars are receiving genuine value, a lawful Silver Certificate that entitles them to a specific amount of silver at a dedicated value of $25 per ounce, and the Liberty Dollar Network will deliver that silver on demand at any time, or buy it back for exactly what we sell it for. Local Merchants can also accept eLD, our Electronic Liberty Dollars, through their websites using our online payments system that can be adapted to shopping carts, or create a shopping cart of its own. This system can be used for sales, donations and subscriptions, just like many other payment processing systems, but payment is made in eLD Digital Silver Certificates. Merchants can also use our eWallet apps to send and receive eLD with a smartphone or tablet. These will be available shortly. The first Paper Silver Certificates issued will be branded for the local community of Live Oak, Florida, where we have our National Headquarters, but it won't stop there. Liberty Dollars can be branded for any community, but remember that they are all Liberty Dollars and can be used anywhere Liberty Dollars are welcome. Liberty Dollars from your community will be happily accepted in Live Oak and any other place where Liberty Dollars are welcome.